Tahiri or tehri is a vegetable pilaf that can accommodate any amount of vegetables, green peas, paneer and leafy greens to make the rice meals a perfect one pot meal. Tahiri is a popular one pot meal with singletons as it saves a lot of effort in the kitchen. Tahiris made in larger families can be elaborate and can accompany a variety of side dishes as well. 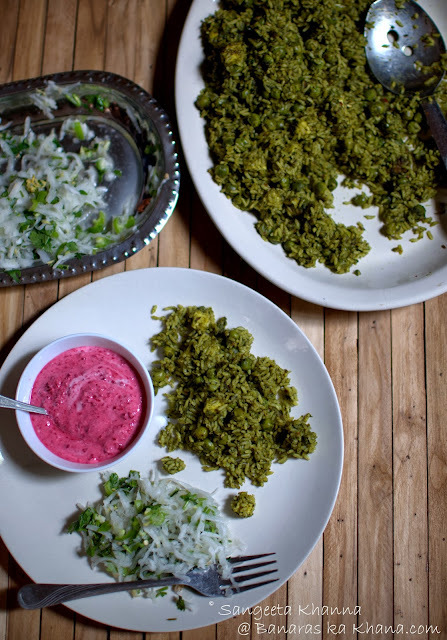 Raita, chutney, kachumber salad, pickle and papad with a winter vegetables tahiri can be a festive weekend meal for some. It used to be for us in the past. We grew up eating loads of greens every winter. Ours was a household where greens were considered gold (well, almost) and everyone liked it too. I don't remember shrinking nose for spinach or other greens that were cooked, throughout the year as we get different types of leafy greens in summers as well. But it was winter time when our dining table was dominated by the colour green. 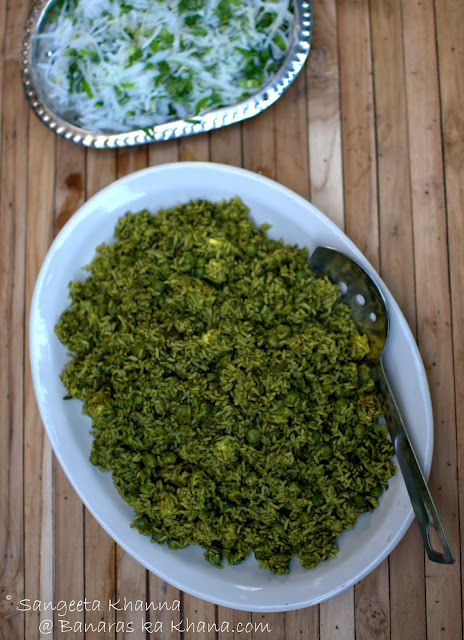 Heaps of spinach, fenugreek greens (methi), mustard greens , bathua will be brought home, sometimes we would contribute to the collective ritual of cleaning and packing the greens for refrigeration and mounds of saag would adorn the plates for each meal. Sometimes the saag was pureed and a curry like palak paneer, palak ka nimona or palak alu dum will be made, sometimes our rice would turn a deep shade of green. That was harey chawal for us if made plain, or hari tahiri when some green peas, paneer, lotus stem slices or soy nuggets were added to the rice pilaf. Raitas of different hues and kachumber salads (salsa like salads) would be made in large quantities as we all loved or salads too. 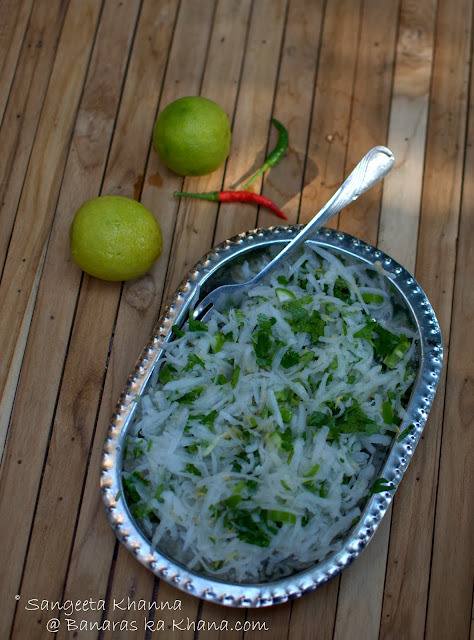 Grated radish salad with chopped green chillies, chopped coriander greens and grated ginger with a generous squeeze of lime used to be a staple along with a tomato salsa type salad with mustard oil dressing. I associate this salad with winters as the radish have this taste only in winters. There are more reasons to eat seasonal foods, taste is one of them. We used t call it mooli ka salaad. This salad is a perfect foil to such tahiris, some spicier biryanis and most parathas that we make only during winters. Some raita or buttermilk rounds up the meal perfectly. I made a roasted beets raita this time with hari tahiri and it was such a soul satisfying meal for a Saturday brunch, sitting outside amongst greens and the sun. Rinse the rice, drain and keep aside. Heat the ghee in a large wide pan or kadhai (wider pan works better to cook the rice evenly) and tip in the cumin seeds and wait till the crackle. Add the minced ginger, green peas and tejpatta and methi leaves one after the other. Add salt, turmeric powder and the spice powders and cook covered for about 2-3 minutes. Add the spinach puree and cook uncovered till the puree starts bubbling up like puffs. Add the cubed paneer, water (double the volume of rice being used, ie, one cup) and let it come to bubbles once again. 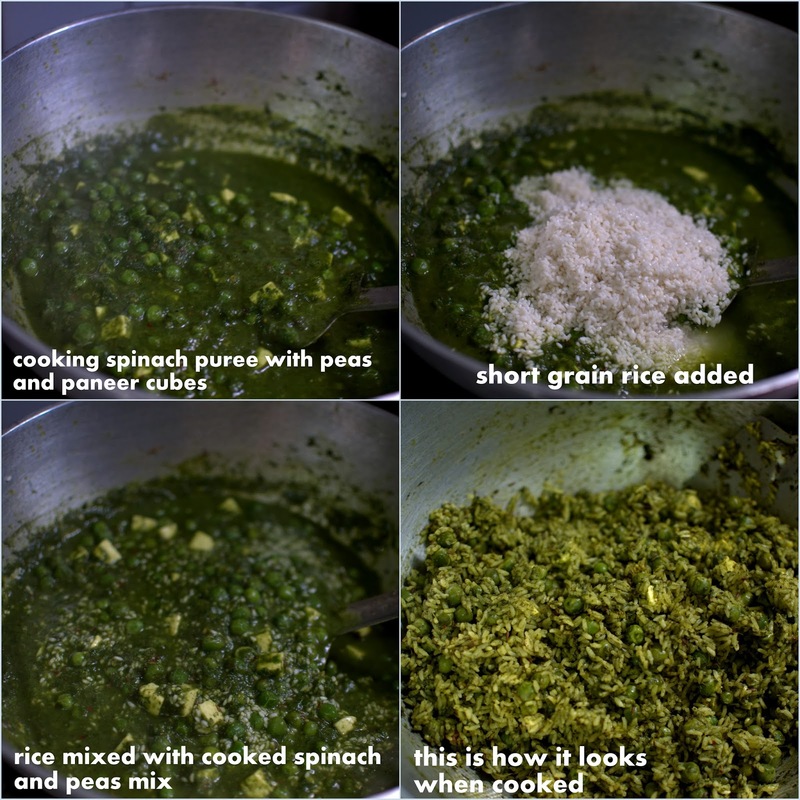 Add the washed rice, mix everything till you see very little trace of rice in the sea of green. Cover the pan with a tight lid and let the tahiri cook at low flame for about 15 minutes. Check if the rice is done and then take the pan off the flame. Let it rest for about 5 minutes and then turn the rice using a flat spatula. Serve immediately with the choice of accompaniments. You can add shrimps or chicken instead of paneer if you want a non vegetarian version. But I like the plain version better as the freshness of winter spinach and green peas is something I wont like to compromise with fish or chicken flavours. To make the roasted beets raita, or chukandar ka raita, I just roasted a large beetroot along with 3 fat cloves of garlic. Peeled them both after cooling and then liquidized in a blender. The puree was then mixed with whipped dahi along with salt and pepper. It made such a lovely meal with all the colours and flavours. Healthy filling meals can be fun, easy and free from unnecessary grease and processed ingredients. 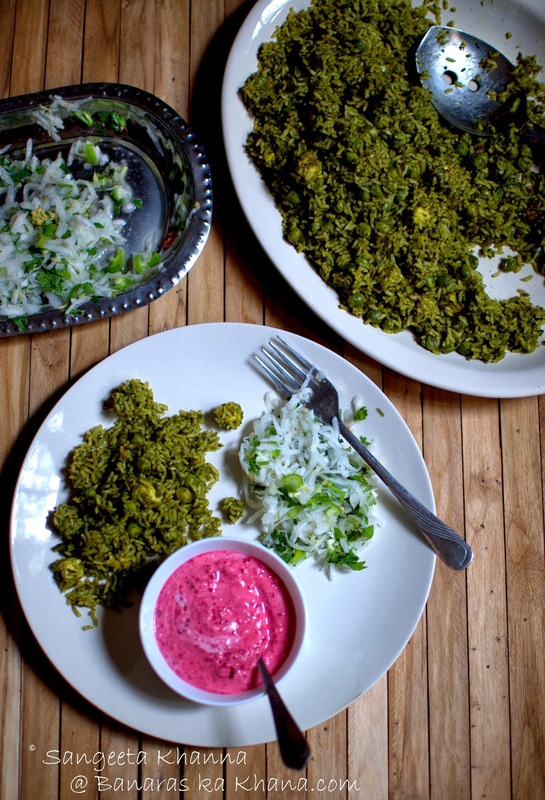 Try this hari tahiri this winter and let me know if it becomes your winter favorite meal too.